Recovery Mode is an essential part of every iPhone which is used in a variety of functions. Knowingly or unknowingly all iPhone users use the Recovery Mode while updating their phone software. Recovery Mode is also used when you have forgotten the security passcode of your iPhone and is not able to get in or access your data. It is very essential to know about Recovery Mode as it can prove very useful during dire situations. The method for getting into and getting out of Recovery Mode is the same but both the processes are different for different models of iPhone. If you want to know how to get iPhone out of Recovery Mode, then read the below tutorial! Tenorshare ReiBoot is an excellent software recommended by many for multiple purposes including entering Recovery Mode, exiting Recovery Mode and for fixing and repairing the iPhone’s operating system. To exit Recovery Mode iPhone without iTunes with the help of just one click using this software, follow the steps below. Step 1: Download and install Tenorshare ReiBoot on your PC/Mac/laptop. Step 2: Connect your iPhone which you wish to exit from Recovery Mode to the PC/Mac/laptop. Step 3: When your iPhone is in Recovery Mode, it will be detected. Now, tap “Exit Recovery Mode” and reboot. This is how to get out of Recovery Mode for free with just 1-click. For detailed operations you may refer to the following video. Exiting Recovery Mode is the same as entering it. But, the steps to get iPhone out of Recovery Mode are different for different iPhone model versions. 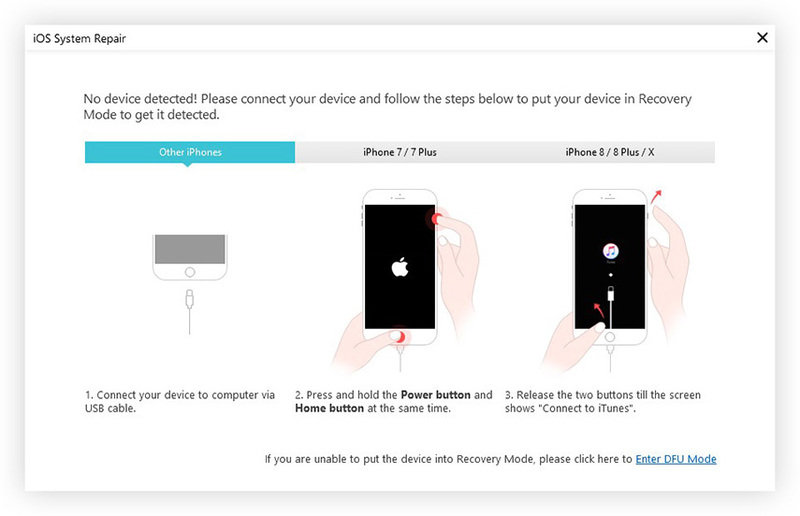 The detailed steps for exiting Recovery Mode for each type of iPhone is given below. Before you press the buttons, don’t forget to disconnect with computer. Press and hold Home & Side buttons, and release them only once you see the Apple logo on the screen. Press and hold Volume Down & Side buttons, and release them only once you see the Apple logo on the screen. Press Volume Up and Volume Down button quickly one after the other and then press Side button, release them only once you see the Apple logo on the screen. Another way to get out of Recovery Mode is by restoring your iPhone. This can be done with the help of iTunes. The only problem with this method is that your phone will be restored to the original factory settings and all your data stored in the phone will get wiped off. This way can be used as the last resort, that is, if no other ways are working. To know how to get out of Recovery Mode with the help of iTunes follow the steps below. Step 1: First check if your PC/laptop/Mac has the latest version of iTunes installed in it. Step 2: With the help of a USB lightning cable, connect your iPhone on which this operation has to be performed, to the PC/Mac/laptop. Step 3: iTunes will detect your iPhone in Recovery Mode. Step 4: Now, tap Restore when prompted to Restore and Update. iTunes will then restore your device to the factory settings by erasing all the data on your iPhone and installing the new iOS on your iPhone. If iTunes failed to do the job, then you can try Tenorshare ReiBoot. It is by far the easiest way you can exit the Recovery Mode and that too for free. Follow the steps below to know how to get iPhone out of Recovery Mode without iTunes. 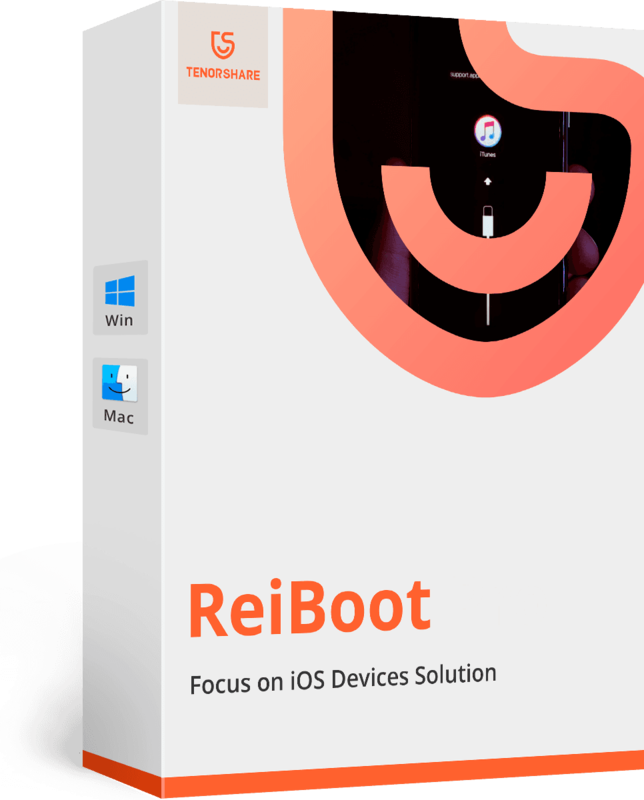 Run Tenorshare ReiBoot on your PC/Mac > Connect your iPhone > Tap “Repair Operating System” > Download the firmware to start repair > Successfully exit Recovery mode with ReiBoot. And you are done! If you need further instructions, we have made a detailed video showing you how to fix iPhone stuck in Recovery mode and won’t exit. This method works not only for iPhone 6/6s, but also iPhone XS/X/8/8 Plus/7/5 and iPad. Many a times there are chances that your iPhone gets stuck while you are trying to exit the Recovery Mode. That’s when you can use the two methods mentioned above to know how to exit Recovery Mode. Out of both the methods, Tenorshare ReiBoot is the most recommended as unlike iTunes, this method exits your iPhone out of Recovery Mode in just one click and also it does not cause any loss of data.